You’ll notice that cookouts will be much more pleasurable when the deadly July sun isn’t beating down. As August is now upon us, it can be easy to convince yourself that you’ll need to start moving yourself inside, soon. No more nights on the deck, or cooking around the fire pit. In reality, outdoor living during late summer can be more beneficial, in a lot of ways, than during high summer. You’ll notice that cookouts will be much more pleasurable when the deadly July sun isn’t beating down. Why not consider a mini makeover before late summer arrives, so you can be ready? First, you’re going to need to make a plan. What do you want your outdoor living to be like? 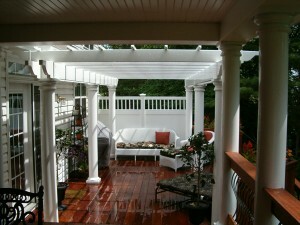 Do you want your screened in porch to be closed off a little more? Do you want your outdoor furniture to be a cozier? Think about how low the temperatures get during late summer nights, and how you will keep yourself comfortable. Then, get to cleaning. Taking care of your outdoor living areas during the seasons is vital when it comes to keeping everything in order. Color schemes make a big difference. As Fall approaches, oranges and browns add a warmer touch. Keep colors dark and maybe even varnish your wood to be a bit deeper. Color can also be added in the form of plants; head over to your local florist and take a look at all the Fall-thriving plants to see what would best fit your outdoor living area. Decorating with plants for late summer requires foliage that can survive in chilly conditions. Yes, this is actually a really interesting way to spruce up your outdoor living area! Carpets for the outdoors usually come with water-resistant fibers that are specifically designed to handle the elements. This will give you an added boost of color and personality, and will surprise your guests who won’t be expecting such a detail. Mid-Atlantic Deck & Fence is ready to help with your outdoor living needs!